Over the past few years the Redondo Beach Chamber of Commerce has improved the public's awareness of the diversity of businesses available in the South Bay. We encourage you to join us and become active in educating residents and businesses on the benefits of doing business locally. Below are some added values and benefits of membership. In order to take advantage of these opportunities, simply join the Redondo Beach Chamber of Commerce! it's quick and easy to become a member. Being a member of the Redondo Beach Chamber of Commerce just got better!! With the new partnership between the Redondo Beach Chamber and Employee Savings Tickets, you can now save up to 50% off tickets to major theme parks, attractions, movie theaters, fairs and festivals, aquariums, zoos, See’s Candies Gift Certificates, Entertainment books, and much more. Join the many members who save big on goods and services from fellow members. Visit the Member-to-Member list under the members only tab. If you’d like to participate in this program, simply call the Chamber to add your business to the list. Every year the Chamber makes over 50,000 telephone referrals to its members. Plus, each month the Chamber receives more than 30,000 visitors to its website. About 80% of our member businesses receive more than 5 referrals per month from their listing at RedondoChamber.org. What a great way to drive business to your door! Just say the word and the Chamber ambassadors will do a ribbon cutting for your business to help celebrate your grand opening, expansion or business anniversary. 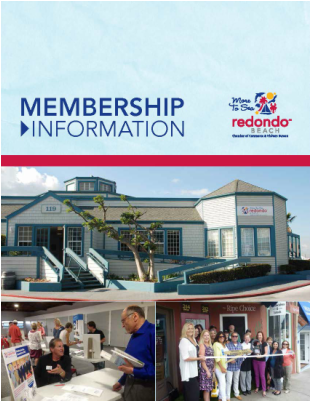 Your membership includes two listings in this publication that is distributed to all residential units and businesses in Redondo Beach as well to the Chamber membership. That’s 30,000 copies! And, for a nominal fee, we can list your business in additional categories. The Chamber’s website provides 24/7 exposure for Chamber members, and attracts about 35,000 visitors each month! Your membership in the Chamber includes a FREE category listing in our on-line business directory with a link to your website. And, for a nominal fee, we can list your business in additional categories on our site. For just $75 per week, we’ll include your business ad on the weekly E-blast on a first come first serve basis.